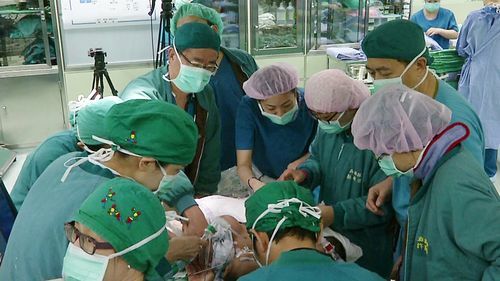 Taipei, March 13 (CNA) Taiwanese doctors in the eastern county of Hualien on Friday successfully separated a pair of conjoined twin sisters from the Philippines who shared a liver. Ludy De Gusman, mother of the 15-month-old twins, burst into tears of relief and gratitude when the operation finished after almost eight hours at the Buddhist Tzu Chi General Hospital's branch in the county. Gusman said she was very grateful to the medical team for helping to give the sisters normal lives. Prior to the surgery, Gusman said, she had shut herself and her daughters off from the outside world and remained confined to their home for a year so that the people in her village would not laugh at them. Lee Ming-che, head of the hospital's department of surgery, commented on the length of the operation, saying that he and his team took extra care to reduce the amount of blood loss, as previous experience has shown them that surgery involving the liver causes the most severe blood loss. The twins -- Jennelyn Mendoza De Guzman and Jerrelyn Mendoza De Guzman -- were taken to Taiwan for the surgery after Kao Jui-ho, head of the Hualien hospital, met them during a free clinic in the Philippines' Bautista municipality last November. Volunteers of the Hualien-based Buddhist Compassion Relief Tzu-Chi Foundation in the Philippines helped to raise funds for the operation and the twins arrived in Taiwan Jan. 9 for preliminary care, which included tissue expansion for skin grafts and liver reconstruction. Chen Pei-jung, the deputy head of the hospital, who organized the team that carried out the surgery, said the procedure was easier than previous operations on conjoined twins as the liver was the only organ shared by the sisters. 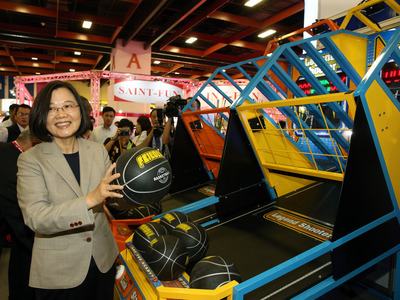 The operation is the third the Hualien hospital has conducted on conjoined twins. The first took place in 2003 and the second in 2010.